and soon through the town to the outskirts amid the farmland where we would find our next resting place in Villares de Orbigo. 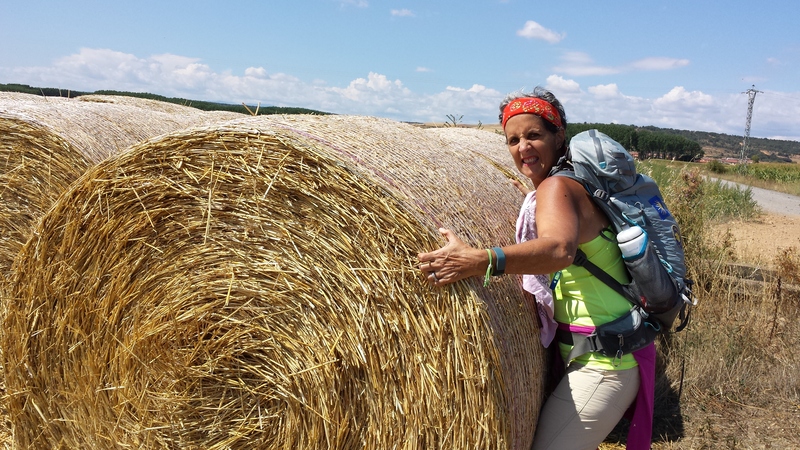 On the way, Heather made an attempt to lift a hay bale with absolutely zero success. I warned her about this, but she still insisted that she should at least give it a try. We both took naps and showers, and fairly soon it was time for dinner. 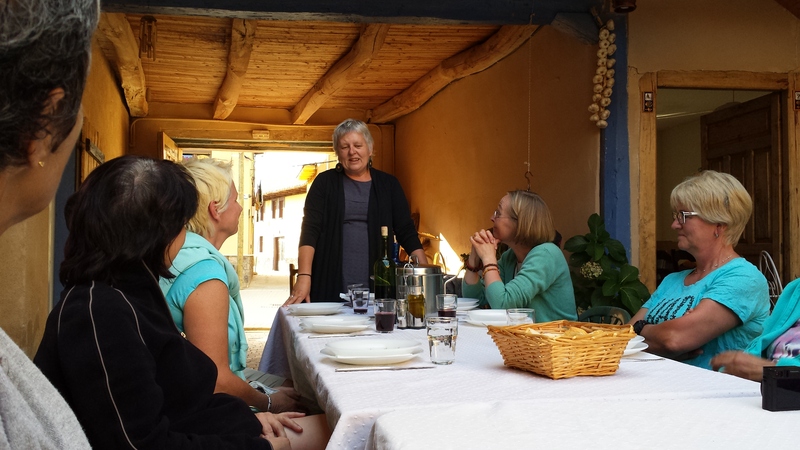 Everyone sat at a large table set up outside in the courtyard, while Christine entertained us with her “speech” that she gives to all the pilgrims as they come through, then proceeded to serve us a delicious five-course meal which she told us was “donativo”. The dessert was a fruit cobbler served with vanilla ice cream. She called this her masterpiece. At dinner we had great conversations with the other guests. The girl from USA turned out to be from Boston. She was suffering from bad tendinitis in one of her legs and was concerned about how far she could go from this point. After dessert, Stephan served us all an aperativ of which he had a huge selection. 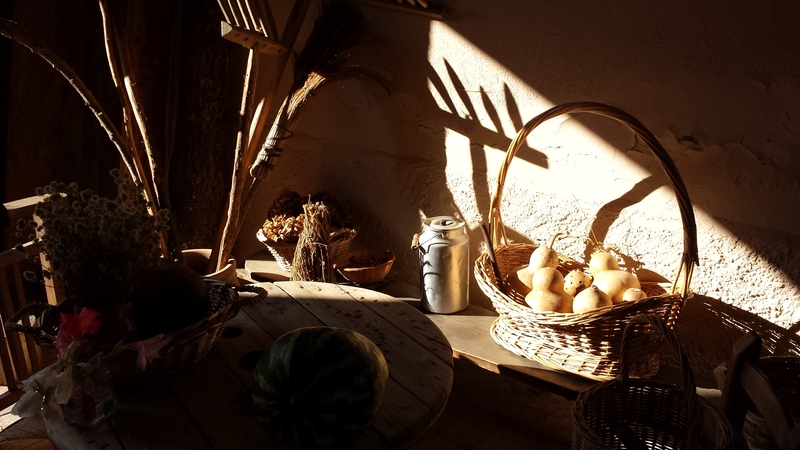 I complemented he and Christine on their artistic display of old artifacts that lined the entry to the albergue. In the morning, Christine had prepared an enormous breakfast feast (also donativo) for us all inside in the kitchen area where she joined us to talk about walking from hereon. 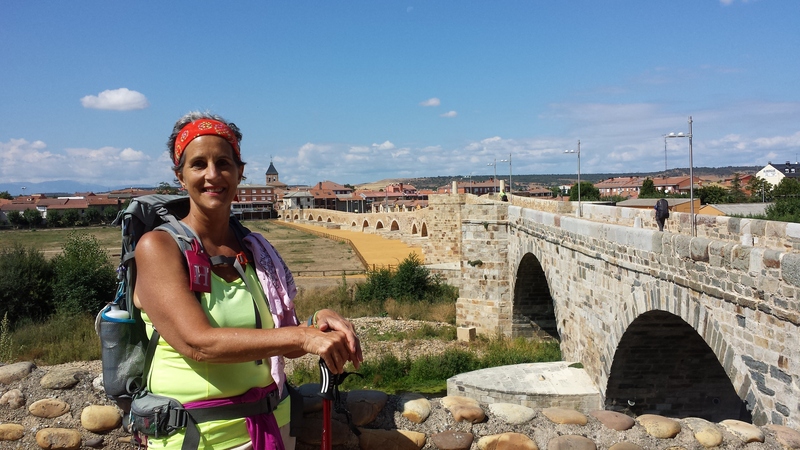 She had a suggestion for us to take the alternative route after Astorga that led to Castrillo de las Polvazares because it was a beautiful little village not to be missed. We thought we might try that since it wouldn’t take us out of our way too much. I made sure to drop a generous offering into the donativo box that was at least what we would have paid for both meals at restaurants. As we walked off, we turned right and they shouted after us and told us to turn left as they waved goobye with big smiles on their faces. An unexpected and delightful experience. 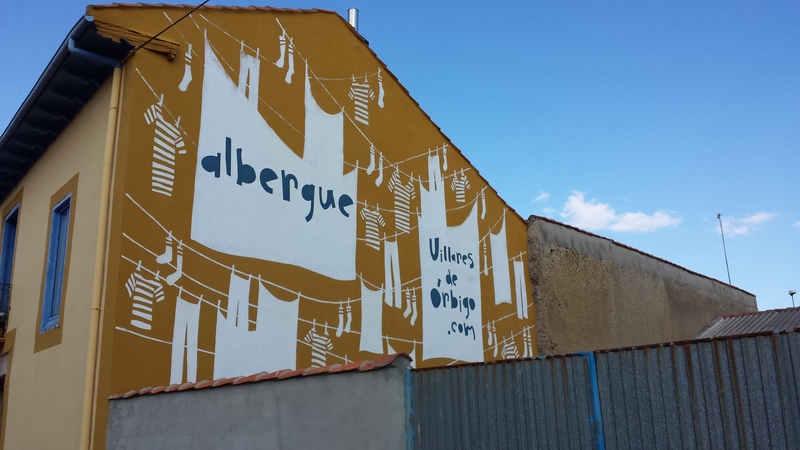 Albergue Villares de Orbigo is highly recommended. It is only 2.2 km from Hospital and well worth the extra little jaunt.